This month's image was taken on Monday the 11th July 1977 at Bangor. 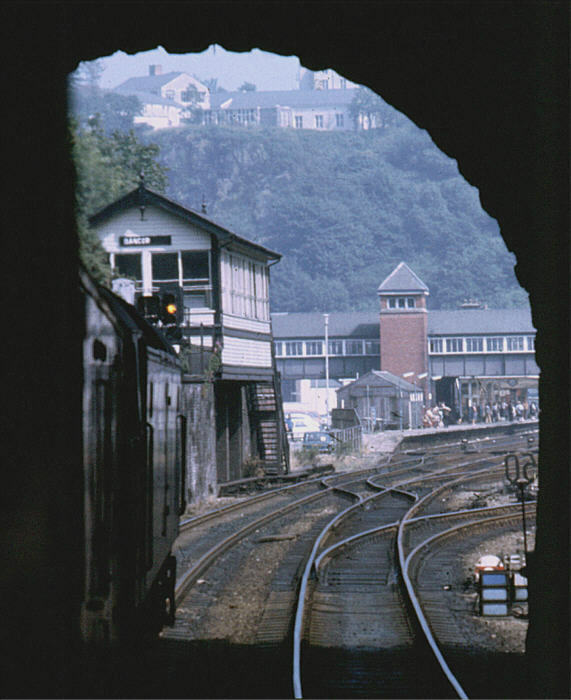 A Class 47 leaves Belmont Tunnel and enters Bangor station on the 15:08 from Holyhead to Manchester Victoria. The signal shows yellow and the route indicator L to permit access to platform 2, where, as well as the waiting passengers, a loaded post-office trolley carries mail to be loaded into the brake van. To the casual observer, the large wooden hut on platform 2 appeared to be there for no purpose - always locked up and deserted. In fact it was used for sorting and handling newspapers in the early hours of every morning when papers arrived by train from Manchester and were transferred for distribution by road. To the right is the ground signal controlling shunt movements from the down line. 5 route indicators were provided to show the routes available - Up loop, Up Main, Down Main, Down Loop and Yard. All shunting movements on the main lines at Bangor involved entering at least one of the two tunnels. Perched on the top of the retaining wall is Bangor signal box, formerly Bangor No 2. This signal box was built by the LMS following the remodelling of Bangor station in the 1920s. It took over the work of Bangor No 1 at the end of the 1960s, and following the singling of the line over the Britannia Bridge in 1972/3, took control of the lines previously controlled by Menai Bridge and Llanfair PG boxes. At that time, all but one of the running line signals at Bangor were converted from semaphore to colour-light.